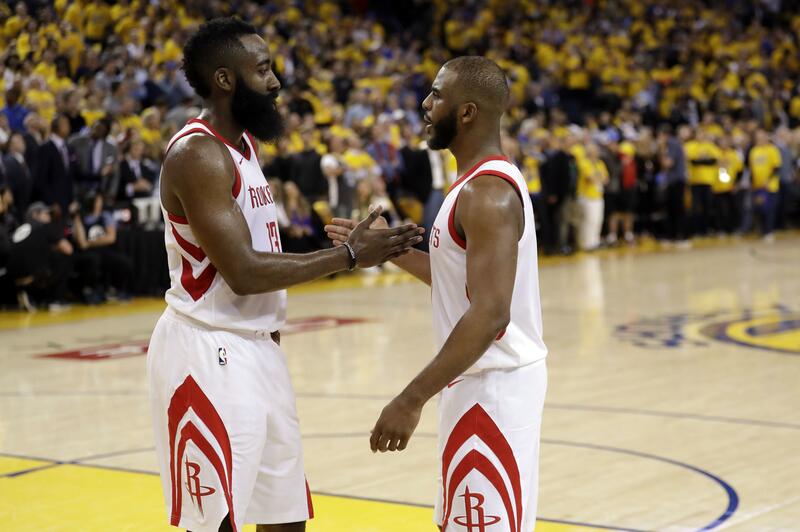 Wed., May 23, 2018, 11:46 a.m.
HOUSTON – The Houston Rockets will wear patches on their jerseys to honor the victims of the school shooting in Santa Fe, Texas, on Thursday night in Game 5 of the Western Conference Finals against the Golden State Warriors. The patches will read: “Santa Fe HS.” It’s one of several tributes the team plans following Friday’s shooting. Eight students and two teachers died at the school, located 30 miles from downtown Houston. The school’s high school choir will perform the national anthem. There will be a moment of silence and a video tribute before tipoff. Santa Fe’s senior class and administrators have been invited to attend the game as guests of owner Tilman Fertitta. The Rockets also will honor first responders on the court. Proceeds from Thursday night’s charity raffle will go to the Santa Fe Strong Memorial Fund. Published: May 23, 2018, 11:46 a.m.